Fall: It’s that sweet spot between end of the summer and the start of the holiday season. 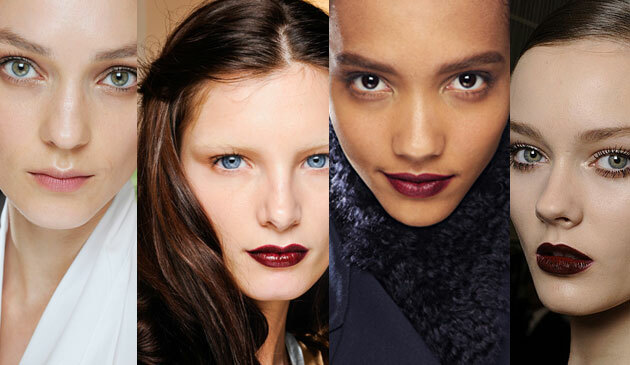 It’s time for you to break out those gorgeous fall lip colors and see how fun they are to wear. Choose from a barely there sheer wash of color, super pigmented mattes, and glossy payoffs. A good number of you have asked me for a lip color round-up to introduce you to some of the shades we see this time of year on the runways and red carpets: deep, rich plums lipsticks, purple-y red glosses, satin-finished blackberries, and sheer merlot stains. It’s not always easy, though, to gauge just how this type of color is going to look on the lips. but it also depends heavily on what your natural lip color is before you start applying. Those with a lot of pink or red in your lips are going to find that the deep purple wine stains can take on a completely different hue, and those of you with a really deep brown color to your lips may find that some of these shades disappear completely on you, or never show up with enough intensity, no matter what you do. In no particular order (really, just the order in which I pulled them out of my big ol’ bag of lipsticks), here are some of my favorites. Those of you who follow this blog based on our shared love for ‘green’ beauty options, please take note that there are a handful of lip colors that don’t fall into that category, however, they’re such rich and dense shades – shades which are not readily available (or at least not that I know of!) in the all-natural world of lip color – that I often use them on photo shoots when I need that intensity. I did just check Jane Iredale’s webiste and found that she has a few deep purple shades that I have not yet tried. When you’re new to wearing these shades, it can be overwhelming to see yourself with a thick application of. 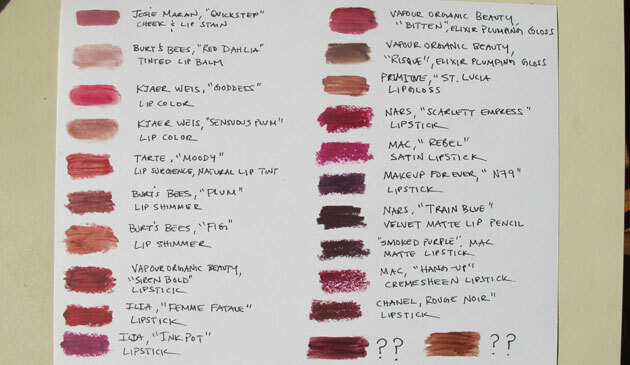 let’s say, Ilia’s ‘Ink Pot‘, or Mac’s ‘Rebel’ (which are very similar in color). Instead, try tapping the lipstick onto your lightly lip-balmed lips, or use your ring finger to tap a good amount of product from the tube, and then press the pigment into your lips. This is how I generally apply all lipstick, even on myself. It helps to ensure less caking along the corners of your mouth as the hours pass, and through the act of pressing the product into your lips, you’ll find it sticks around longer than if you simply swipe the tube across your pout once or twice. There are a multitude of great sheer options on the market that are easy to apply, and the more swipes across your lip, the deeper the shade becomes. My top favorites include: Burt’s Bees Lip Shimmer in’Prune’ and Kjaer Weiss’ ‘Sensuous Plum’. Trying out a lipstain, like ‘Quickstep or ‘Foxtrot’ [Foxtrot not pictured below]’ from Josie Maran is another great way to become acquainted with these shades. To start, color the marker onto UNMOISTURIZED lips (this is important to ensure the color will adhere), and then try following up with a gloss, like the gorgeous blackberry one from Vapour Organic Beauty in ‘Bitten‘, or their more chocolate shade ‘Risque‘. This makes for a luscious and easy to wear fall shade. If you’re going for a much more dramatic look, make sure that your lips have been moisturized, but then blot them with a tissue, to ensure that your deep lipstick of choice adheres evenly, and depending on the look you’re going for, you might want to lightly outline your lips in a similar shade lipliner to ensure the color doesn’t bleed. I wouldn’t advise that a dramatically deep, highly pigmented purple or merlot shade (like the one pictured on the model in the photo on the right) EVER be highly glossy (i.e. adding gloss on top of the lipstick) in real life (a photo shoot is a different story). It’s guaranteed to slide off your lips, appear blotchy, and get on your teeth. This means that a super deep shade should be in a matte, satin, or have a super light dewey finish. It’s a great idea to lightly touch a tissue onto a closed mouth to ever so slightly remove excess product. My picks to accomplish this kind of look: NARS, ‘Train Bleu’ matte lip pencil, Chanel ‘Rouge Noir’ Lipstick, MAC Smoked ‘Purple Matte’ Lipstick, and Vapour Organic Beauty ‘Siren Bold’ Lipstick. HOW TO AVOID: THE DREADED LIPSTICK ON YOUR TEETH LOOK! 1. after applying your lip color, open your lips into an ‘O’ shape. 2. grasp a cotton swab by the middle between your pointer finger and thumb, placing one end of the swab into your mouth, keeping your fingers on the handle, just outside of your mouth with the other cotton bud end pointing straight out, parallel to the floor. 3. Pucker your lips like you’re blowing a kiss around the handle of the swab, and gently pull the swab out of your mouth, making sure the inside of your lips comes in contact with the cotton as it leaves your mouth. 4. Repeat with the other side of the swab. Voila – all of the excess color that would’ve ended up on your teeth has been swept away! Packing a few q-tips in your purse is always a good idea, to use for this trick, or to clean up fallen mascara. The final two shades on the bottom right of the photo below are soon to be released, are part of the ‘green’ family of beauty products, are super affordable, and super beautiful. Once they hit the market I promise to tell you who makes them! Happy leaves-changing, sweater-wearing, chilly hands, feet, and noses, FALL WEATHER everyone!